Come to Paris and experience it like a Parisian, not like a tourist: that’s exactly what Paris residents and close friends, Jessie Kanelos Weiner and Sarah Moroz, both 33, hope that all visitors to the city can do. 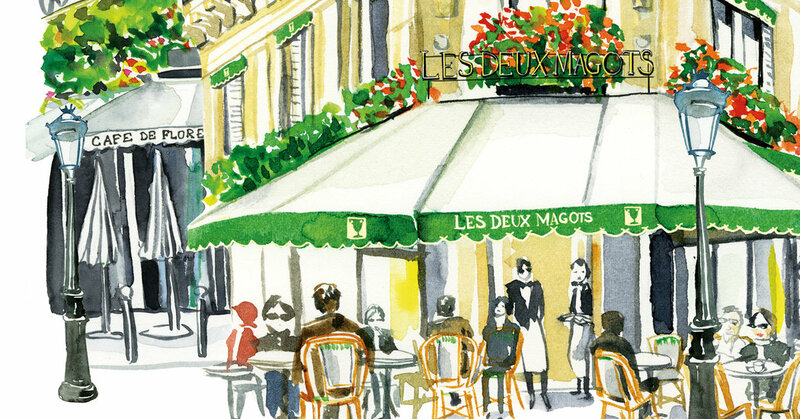 Their new book “Paris in Stride” aims to help tourists get this insider’s perspective — it’s divided into seven walking tours that include popular attractions but focus on lesser-known neighborhoods, along with under-the-radar tourist sites, restaurants and shops; Ms. Moroz did the writing while Ms. Kanelos Weiner did the illustrations. Both moved to Paris soon after graduating from college: Ms. Kanelos Weiner worked as an au pair in the city and was drawn to the rich culture, history and fashion scene. “I decided to make it home,” she said. Ms. Moroz, who is half French, came to Paris with the intention of spending a year exploring the city before returning to New York, but, too, chose to settle there. The duo met at a magazine launch party in Paris two years ago and became fast friends. Below are excerpts from a recent conversation with them. How did you conceive the idea for the book? Ms. Kanelos Weiner: I had already published a book with Rizzoli called “Edible Paradise,” and my publisher there was interested in a book on Paris so I asked Sarah if she would be interested in collaborating with me. Ms. Moroz: When Jessie approached me, I immediately thought that I wanted to share our view of Paris with others that we get from living here but most visitors don’t have. People tend to visit the sites that they’ve heard about, but the city has so much more to offer. Ms. Kanelos Weiner: People come here and want go to the best pastry shop or best brasserie, but there is not one best. Every neighborhood has something beautiful to offer, and tourists sometimes miss that. Your book is divided into walks. What makes Paris a great walking city? Ms. Moroz: A lot of great sites are within a short walk from each other. Also, the city is pedestrian-friendly, and everything is accessible by foot — locals tend to do a lot of walking. But one of the best parts of walking in Paris is that you get to see the liveliness of the streets. You can people watch and see the cafe culture where Parisians sit outside, drink their coffees and read the newspaper. Walking gives you a true connection to Paris. Do you each have a favorite neighborhood in Paris? Ms. Kanelos Weiner: I love Palais-Royal, which is near the Louvre. There’s an area right behind the museum which has covered walkways and arcades with stores. This is where Parisians walk their dogs and go on strolls. It’s quiet and untouched by time. Ms. Moroz: I am partial to the neighborhood I live in, Belleville, because it’s so diverse. It has a little Chinatown here, an emerging gallery scene and two big parks. It’s not touristy and really vibrant. Yes, it’s dirty and there aren’t that many historical monuments, but it is a version of Paris that thrives. Is there a must-see historical site in Paris in your opinions that tourists tend to miss? Ms. Kanelos Weiner: The opera house Palais Garnier. It’s gorgeous and Paris opulence at its best. Marc Chagall painted the ceiling. Ms. Moroz: The Museum of Hunting and Nature. It’s in a building from the 17th century and a cabinet of curiosities of sorts. It has a great permanent collection and also temporary exhibitions from contemporary artists. People think of Paris as a pricey destination. Is this true? Ms. Kanelos Weiner: Like any major city, it is expensive, but not everything has to be. You can get a great croissant for one euro, for example. When my friends come to town, one of my favorite and inexpensive things to do is to take them walking along the Seine. Along the way, we buy a baguette, pick up some cheese and chips, a couple of pastries and a bottle of wine and find a spot to have a delicious picnic. Ms. Moroz: You can spend a lot of money here on mediocre hotels and restaurants, but you can also find fantastic food and wine at great prices. Of course, walking is free and the best way to appreciate Paris’s beauty.